A note for those reading this piece, itiba’s MidNite Rain and Crucian Spice both contain this wonderful, exotic, spicy essential oil. Again, when this essential oil is paired with both nutmeg oil AND clove essential oil (as in the Crucian Spice blend), you now have a wonderful blend that is great to use in rubs for tired, sore muscles. But remember, use sparingly if making your own home made remedies and make sure you are using a reputable supplier of essential oils. The information on Black Pepper Essential Oil is taken directly from the OrganicFacts.net website. Once upon a time, it was considered sacred and even used as currency. 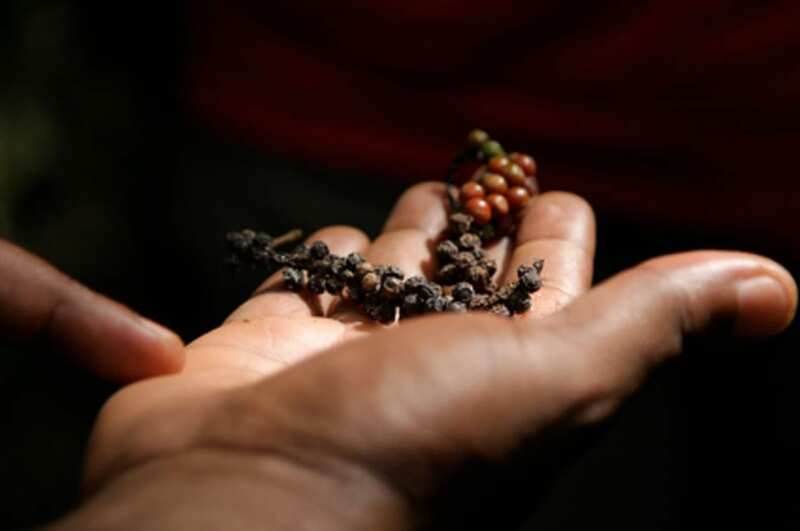 It was so valuable that it was traded in exchange with gold (gold was considered cheaper to Black Pepper) and was one of the most priced trade items exported from India to the rest of the world. The main components of its essential oil are Limonene, Pinene, Myrcene, Phellandrene, Beta Caryophyllene, Beta Bisabolene, Sabinene, Linalol, Pinocarveol, Alpha Termineol, Camphene and Alpha Terpenene. Apart from them, black pepper is rich in minerals and vitamins like Calcium, Manganese, Iron, Vitamin-K, Beta Carotene, Phosphorus, Potassium and Selenium. Let us see what health benefits Black Pepper Oil has in store for us. Anti Spasmodic: It is an effective anti spasmodic and gives good relief in cases of cramps, muscles pulls, spasms, convulsions etc. Anti Rheumatic & Anti Arthritic: These are two of the best qualities of the Black Pepper oil. It is warming, stimulating and improves circulation, thereby giving immediate relief in rheumatism and arthritis, particularly in winters when the symptoms aggravate. It is also effective in removing toxins like uric acid from the blood, thereby benefiting people suffering from chronic rheumatism and arthritis, gout etc. Diaphoretic & Diuretic: Black Pepper oil, when ingested, increases sweating and urination. Both of these properties play an important role in removal of toxins from the body, clearing of the pores in skin and also disinfecting the body. Sweating and urinating help lose extra water and fat from the body, thus reducing weight, lowering blood pressure and making the body relaxed. These properties are also helpful in reducing inflammation. Anti Oxidant: This is yet another beneficial property of Black Pepper oil. It protects the body from damages done by oxidants (free radicals) and also helps repair them. It also delays adverse affects of aging such as vision loss, macular degeneration, wrinkling of skin, degeneration and loosening of muscles, loss in mobility of joints, nervous disorders, memory loss etc. Anti Bacterial: It has good anti bacterial properties and that too, without side effects. It is very effective in curing bacterial infections in mouth, colon, digestive system, urinary tract etc. It also disinfects food stuffs in which it is added and protects them from bacterial infections for long. Other Benefits: Black Pepper oil is rich in certain very useful minerals and vitamins too. For example, there is vitamin-A (Beta Carotene) in it, which is very beneficial for ocular health as well as is a very good anti oxidant. It has vitamin-K which is essential for maintaining proper circulatory and metabolic functions, muscles, bones etc. Then it has calcium, potassium and selenium. While calcium is good for bones and potassium for regulating blood pressure, selenium is essentially required for proper formation of bones, nails, hair, follicles and teeth and for proper functioning of brain. Few Words of Caution: As such, there is nothing to be scared about Black Pepper oil, except that if taken in large quantity, it may cause uneasiness, unrest, vomiting, loose motions, irritation and inflammation of the intestines, sleeplessness etc. being hot and pungent. But there is nothing serious about these symptoms. Blending: Black Pepper Oil can be blended with Lemon, Lime, Lavender, Sage, Sandalwood, Mandarin, Ylang-Ylang, Juniper, Bergamot, Clary Sage, Clove, Ginger, Geranium, Coriander, Grapefruit, Fennel and Frankincense Oil.